Here is the dress overall. So sweet! My daughter really wanted to be Zelda for Halloween, but she didn't want to be the mainstream Zelda you can pickup in prepackaged form. No, she wanted to be the Zelda from Skyward Sword. So what's a mother to do? Good thing I know how to sew! I started from scratch, got a dress pattern, some pink fabric, and pieced everything else together as I went along. The belts are made of felt and the dress and sailcloth is cotton. I painted the symbols on with puffy paint. Overall, I would say the project cost between 30-40 dollars, but I didn't keep a very good record of the receipts. We even thrifted the boots just for this costume. I'm really happy with the way it turned out! I'm also thrilled I got to put my sewing skills to good use and make her happy. 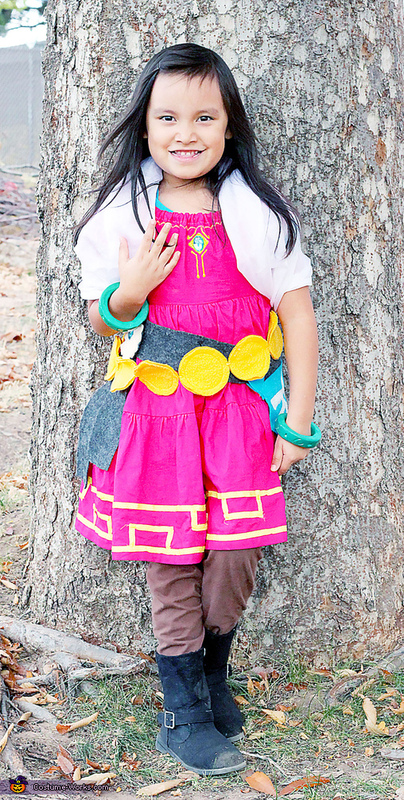 She's the cutest little Zelda I ever saw.